Mexican President Felipe Calderón met with the directors of the Sanofi-Aventis Group, led by Director General Chris Viehbacher, at the official Los Pinos residence today. During the meeting, it was announced that the company will provide Mexico with a million A/H1N1 flu vaccinations of the 20 million that will be purchased in order to ensure that by the end of November, health personnel that have direct contact with patients infected with this virus will be vaccinated. Another four million vaccinations will be delivered in late December followed by 15 million in late January. They also discussed the joint project between the Government of Mexico, through the Biological and Reagent Laboratory of Mexico (BIRMEX) and Sanofi-Avenis for the production in Mexico of flu vaccinations. Production is expected to begin in 2011 with all the tests of stability and security so that it is produced commercially in 2012, with a total output of approximately 25 million doses. 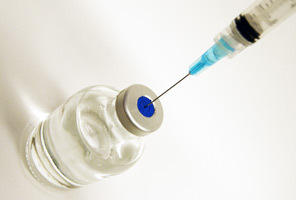 The representatives declared that they have already obtained permission from the Federal Commission for Protection from Health Risks to commercialize the vaccine in Mexico. Sanofi was represented by Director General of Sanofi-Pasteur, Wayne Pisano; Vicepresident for Latin America of Sanofi-Pasteur, Guillaume Leroy, and Director General of Sanofi Aventis of Mexico, Juan Carlos Valdés.